Brandt Schubbe is a writer from St Paul, Minnesota. He has written five books, a play. He has two bachelor degrees, and a minor in Creative Writing. In Brandt Schubbe’s collection, The Auburn Book, the persona opens up in the narrative pieces giving us a glimpse of their difficult and sometimes chaotic life. These experiences are coupled with a revelation of their struggles and hopes. He narrates his struggles with bipolar disorder, loneliness, and making better choices. The lines "Drunk I am, Stoner I am, Bipolar I am” reveal his struggles with the disorder and also with drugs. A couple of times wrong decisions land him in jail and when he is out, he goes to see his mother who is ill. The collection reflects upon the person’s regrets, painful memories, internal struggles, hope for the future and the strain to live through most days. In many ways, The Auburn Book is revealing and open regarding the character’s emotions. The persona is not perfect. He struggles with difficult decisions and life choices as well as things beyond his control. This makes the poetry authentic as it reflects everyday struggles that many can relate to. The collection also contains vivid descriptions and imagery which provide a suitable background for the poems. Every word is placed carefully into the poem. Since the poet uses very few words, those that are chosen are powerful and telling. Most parts of the collection are fast paced but sometimes the pace is slow, allowing readers time to take in the words and the experiences behind the text. The Auburn Book by Brandt Schubbe is candid and tells the story of an imperfect character, which makes it real and absorbing. It is just one poem yet reveals a lot of emotions that flit across the poet's mind in The Auburn Book: Introducing The Poem; 2019, In A Poem by Brandt R. Schubbe. The poet raises a lot of questions in the minds of readers and will make them contemplate these in their lives. The poem also is also about the poet trying to figure out who he is and find a meaning to life. There is a feeling of timelessness in the poet's voice and this is tangible through his assertive, succinct use of words and minimalist style of expression. 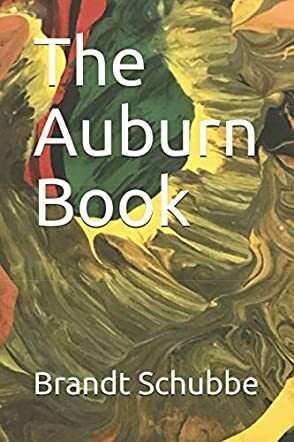 From its title, readers might assume that The Auburn Book is based on a darker shade of poetry. Brandt Schubbe crafts his poetic dreams around sad thoughts, but never without hope or rescue. The author uses short verses to complete the idea of the random thoughts and erratic patterns of a dream state. Notions of death, wanderings, pondering of drugs and their effect on life are woven within his words, as is baseball, love, and family. Even these could have a gloomy side. The poems appear as if the author views himself as an unknown entity, void. On the other hand, the author sees poetry as a spirited bike ride that soars. Each verse adds knowledge and longer life as it travels. I found Brandt Schubbe’s The Auburn Book a bit melancholy, yet mysterious. The verses reflect sorrow and despair, but I felt the author was just reflecting on a time when life had no direction as a ship tossed to and fro. Thoughts are thrown together like a dream that quickly changes direction and is unsure if it will survive. Reading this book, I pulled out inspirational words that will become part of me. "Love is like being dipped in chocolate for the time" would probably be my favorite thought. It fascinated me with how the train of thought became clearer and more focused when he tracked down his demon to destroy it. The reader will find this poetry does not rhyme and appears as if the thoughts came from different people or split personalities. I think those who like darker poems would relate to this author and connect with his writings. The Auburn Book is a work of personal reflective poetry, penned by author Brandt Schubbe. The volume contains a single epic poem: 2019, In A Poem, and a brief introduction by the author. Through short verses and small, poignant statements, the narrative tells the tale of a year in which the author experienced some terrible trials and pain, expelling those emotions to convey a kind of supernatural experience to readers. Though it begins in darkness, the journey continues into the light as love enters the narrator’s life, bringing the poem to a close on a more hopeful note for the future. Epic poetry is not everyone’s cup of tea, but I found great comfort and relatability in poet Brandt Schubbe’s continuous tale of emotional reactions and real life situations gone awry. Schubbe is raw and honest in his portrayal of himself and the struggles he deals with in life, leading to the pain and difficulty that the narrative takes us through. Though I think it might have benefited from some very mild structuring, readers who are familiar with stories in verse will be able to follow the tale as the author eventually experiences love and hope. This was my favourite section of the epic tale, where the verses were bright and filled with the most vivid imagery that really brought the world into living color after so much darkness. Overall, I would recommend The Auburn Book to readers who want to decipher an extensive tale from the bottom of a poet’s heart. The Auburn Book by Brandt Schubbe is a poetry book written in the first person by Brandt. This book is interesting and different from most of the poetry books or poetry collections in the sense that it is just one long poem throughout the entire book. The poem itself is composed of only a few words, sometimes just one or two words, in each line. The poem talks about personal experiences and impressions, whether they come from reality or dream states or just alternative states of reality. That thin line is not always clear and the poem itself talks about various emotions and events that may be memories, people and family members that may have had an effect on lives, as well as various other mundane topics such as music or dance. In that sense, this poem is about both trivial events as well as major or transformative experiences. The Auburn Book is an interesting twist on a poetry book. The writing style is quite engaging and some of the words come together quite well to convey the meaning in a minimum number of words. The formatting of the book itself falls short in this case and a solid introduction to the book at the beginning about what to expect or what the book is about would have helped. The poem itself conveys subjective impressions and appears to leave it up to the reader at times to decipher dreams from reality which is interesting. Readers who enjoy poetry books and who might be looking for something a bit different than usual should try this one.